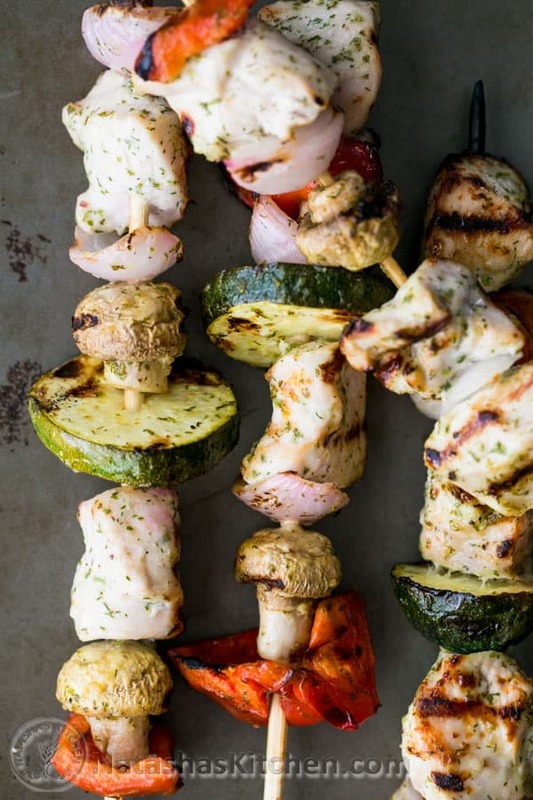 Throw these skewers on the grill and you will see your neighbors noses peeking over the fence. They smell and taste phenomenal! 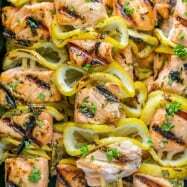 My cousin Alla shared this shish kabob recipe with me. Apparently it’s quite popular in Washington state. Alla, I’m so glad you introduced me to this healthy and delicious marinade. 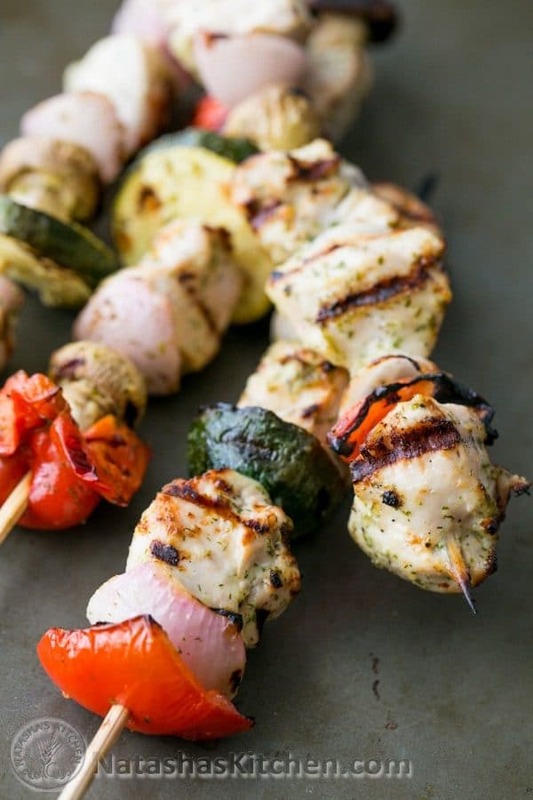 The first time I made these skewers I thought they were pretty good except I forgot the salt! Salt is a wonderful and necessary thing you know. Of course, I knew I had to make them again. And now, I will make them again,… and again, and again! Note: you may also use Mexican squash or any other squash you like. 1. 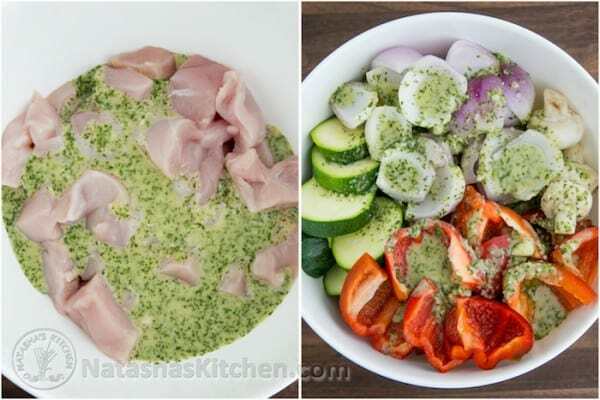 In the bowl of a food processor, combine all marinade ingredients and pulse about 15-30 seconds until well blended/chopped. You don’t even have to chop the garlic or parsley by hand. Don’t forget the salt. Done! 2. 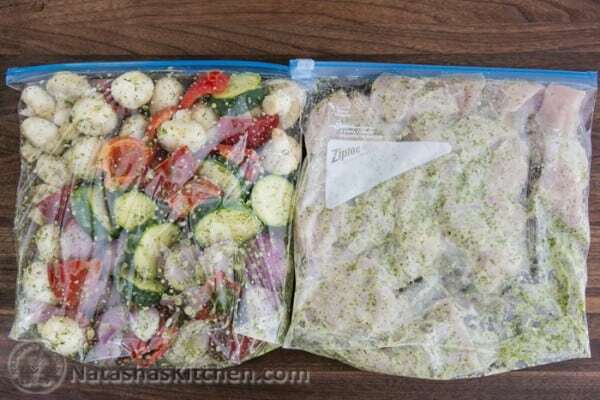 Mix Veggies with half the marinade in one ziplock bag, and chicken with remaining marinade in a second ziploc bag and toss to coat with marinade. Refrigerate for around 4 hours, stirring occasionally. 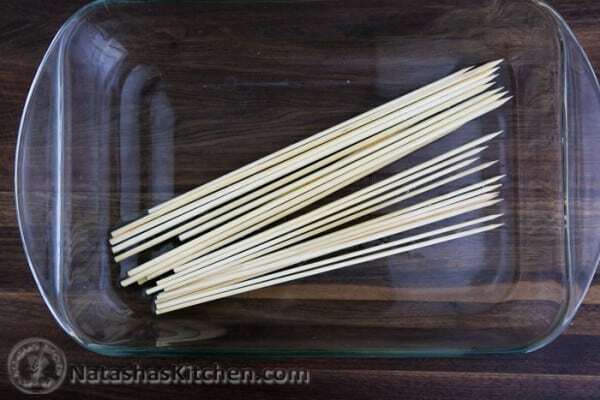 3.While veggies and chicken marinating, soak wooden skewers in a water bath; the longer the better. This keeps the skewers from burning on the grill. 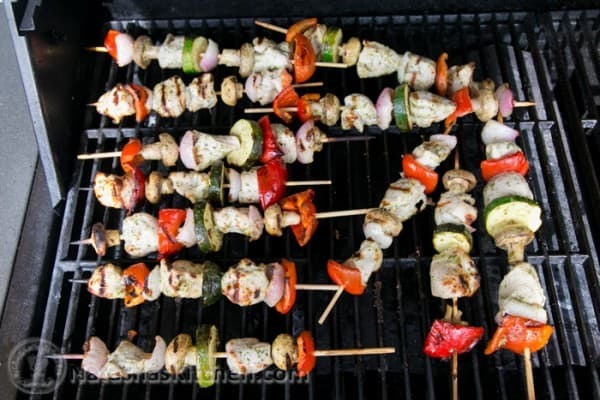 4.Start preheating your BBQ to around 400˚F. Thread meat and veggies on the skewer and grill over medium heat with the lid closed, turning every 2 minutes until chicken is fully cooked, approximately 15 min. 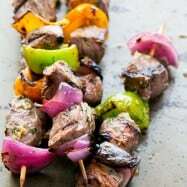 Enjoy this super flavorful kebab recipe! 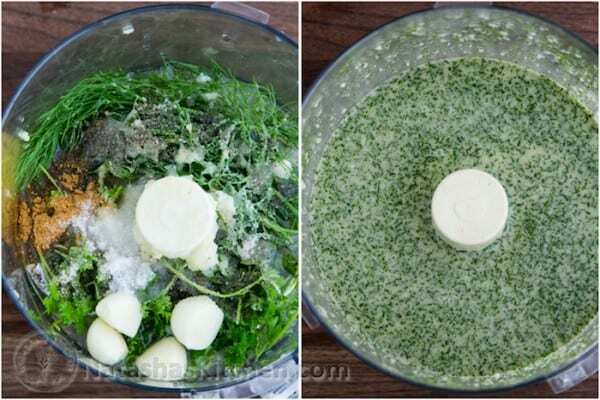 In the bowl of a food processor, combine all marinade ingredients and pulse about 15-30 seconds until well blended/chopped. Don't forget the salt. 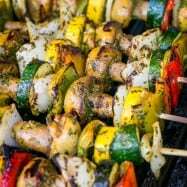 Mix Veggies with half the marinade in one ziplock bag, and chicken with remaining marinade in a second ziploc bag and toss to coat with marinade. Refrigerate for around 4 hours, stirring occasionally. 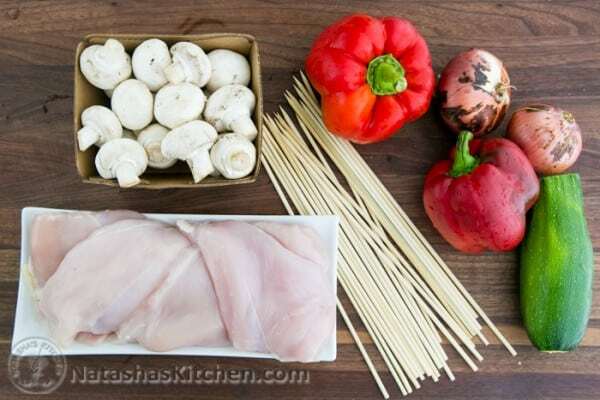 While veggies and chicken marinating, soak wooden skewers in a water bath; the longer the better. This keeps the skewers from burning on the grill. Start preheating your BBQ to around 400˚F. Thread meat and veggies on the skewer and grill over medium heat with the lid closed, turning every 2 minutes until chicken is fully cooked, approximately 15 min. Enjoy! 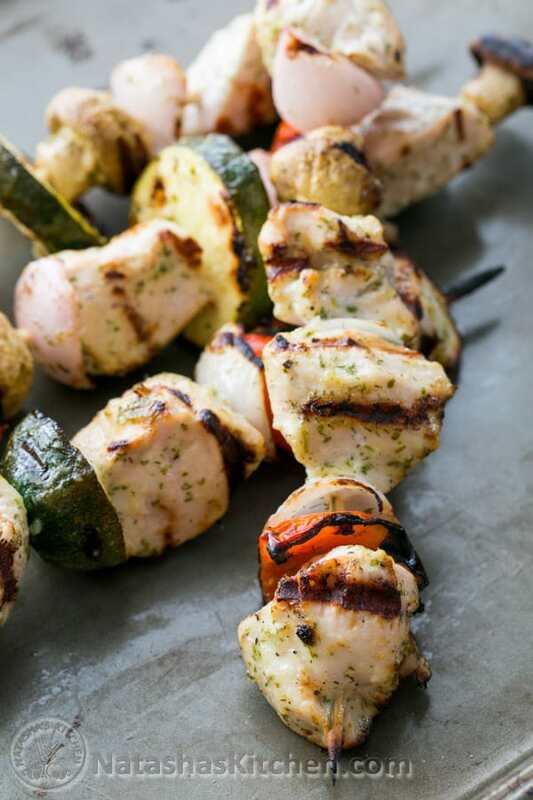 These Shiskabobs reheat well, just place them in your oven at 400˚F for 10 min. Or remove from skewers and toss over a hot skillet until heated through. 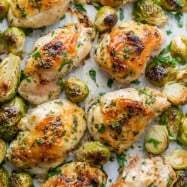 Hi Natasha, I’m excited to try this recipe but I’m wondering if I make extra can they be frozen, and how would I go about defrosting them? 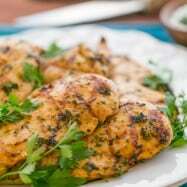 I have in the past made extra marinate and poured it over the extra meat that had and then put in freezer and when my family wanted to grill just pulled out of the freezer put in fridge let it slowly defrost and soak in the flavor. Or you can freeze the extra marinate that you have and use it when needed. Done both ways. That really is a great idea! Thanks Alla! 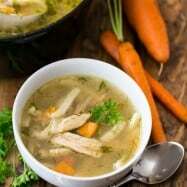 I love easy meal ideas! I made these last night, they where great but a bit on the tangy side. Natasha did your’s taste tangy to you or maybe it was just me? These look amazing….and I can just taste them. 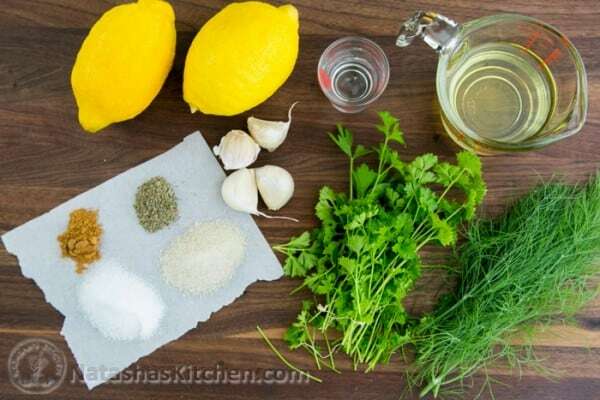 I’ll try this marinade and make it for my husband, as he is Turkish and that is one of their main food items the “Shish Kabob.”They serve them everywhere.